!! Om Namo Narayanaya !! THE BEST WAY TO LEARN ANY SUKTAM ON THE GO... "VEDHA PATASHALA SERIES"
This great mantra is taken from Taithreeya Aranyakam (1.22) of Yajur Veda. It is one of the most famous of all veda mantras and remains quite popular till date. It is normally sung in a chorus by all the priests together after performing any Pooja (worship) or Yajna. The basic message contained in this mantra is that water is the basis of this universe. However, one can experience much deeper spiritual meaning. Serious readers would surely ponder deeply at the hint in the mentioning of a "raft" in the paragraph "Samvastaro Va Apamayatanam ...." of this mantra. 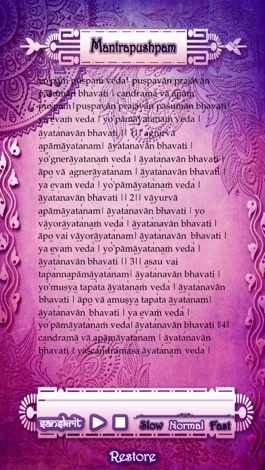 Be blessed to recite this vedic suktam. - To begin with , it is recommended to start learning Mantrapushpam from a Guru, since, it is supposedly the traditional way of learning any Vedic Hymns or Stotras. - Mantrapushpam, unlike other Slokas or Mantras, has great significance, when its notations are recited in the appropriate pitch. The notation for marking the syllables for chanting is generally known as the swara notation, signifying the pitch variation applicable to the vowel in the syllable. 3) If you see a vertical line above a letter, you have to raise the pitch – ' swarita '. 4) If you see a double vertical line above a letter, you to raise and the pitch and stretch it –' deergha swarita '. Our app makes the above procedure so simple in providing you the mantras in 2 languages – English and Sanskrit with audio enabled. The text gets auto scrolled as you read or follow the mantra, which makes learning much easier. You also get 3 speed levels – Slow, Normal & Fast as per your convenience. It is so good to have this app on your phone. Play it on a daily basis, feel the bliss and get the blessings! This is an ad-supported version with Limited Features. Full audio for all speeds with relative text scrolling, Upgrade to PRO version.